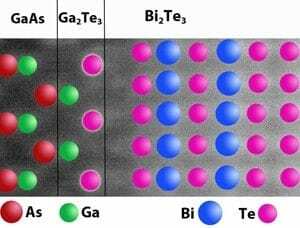 For years, researchers have developed thin films of bismuth telluride (Bi2Te3) – which converts heat into electricity or electricity to cooling – on top of gallium arsenide (GaAs) to create cooling devices for electronics. But while they knew it could be done, it was not clear how – because the atomic structures of those unlikely pair of materials do not appear to be compatible. Now researchers from North Carolina State University and RTI International have solved the mystery, opening the door to new research in the field. To study the phenomenon, the researchers had to create the nanometer-scale thin films on a GaAs substrate, or foundation. The GaAs is first placed in a vapor deposition chamber. Molecules containing bismuth and tellurium are then introduced into the chamber, where they react with each other and “grow” into a crystalline Bi2Te3 structure on the surface of the GaAs. Using advanced “Super-X” X-ray spectroscopy technology in conjunction with an aberration-corrected scanning transmission electron microscope, the researchers were able to determine what was binding the Bi2Te3 to the GaAs – and it was not what they were expecting. They found that when the tellurium molecules were introduced to the vapor deposition chamber, the tellurium reacted with the GaAs substrate to create a new surface layer of gallium telluride, which was only one molecule thick. The Bi2Te3 then formed a thin film on top of that new surface layer. Because gallium telluride does not react with Bi2Te3, the research team knew chemical bonding could not be holding them together. Instead, the two layers are held together by the weaker force of van der Waals bonds – meaning the materials are held together by weak electrical forces. “While these materials have been investigated previously by RTI and NC State, the state-of-the-art techniques applied by LeBeau and his team have revealed significant new insights into how the film grows,” notes Dr. Rama Venkatasubramanian of RTI International, who is also a co-author of the paper. The paper, “Atomic scale structure and chemistry of Bi2Te3/GaAs interfaces grown by metallorganic van der Waals epitaxy,” is published online in Applied Physics Letters. Lead author of the paper is Houston Dycus, a Ph.D. student at NC State. Co-authors are Ryan White, a postdoctoral researcher at NC State; Drs. Jonathan Pierce and Rama Venkatasubramanian of RTI International; and LeBeau. The research was supported by the Defense Advanced Research Projects Agency.